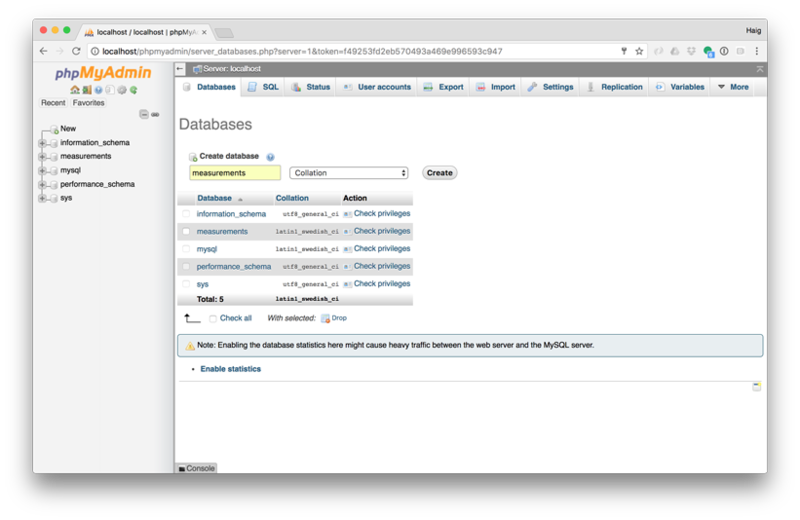 Using the phpMyAdmin web interface (http://localhost/phpmyadmin) that we set up, log on using the administrator (root) account and create a database called ‘measurements’. The following code (which is based on the code that is part of the great temperature sensing tutorial on Adafruit) is a Python script which allows us to check the temperature reading from the sensor approximately every 10 seconds and write it to our database. The full code can be found here(pi_temp.py). Additionally, if you’d like to use the Grove Pi, I’ve altered the grove_sound_sensor.py script to store the data values to our Measurements database.